Bus leaves Auckland at 07:30 am driving through beautiful lush New Zealand countryside to the infamous Rotorua, a quick morning tea and coffee and stretch legs stop will be provided before arriving in Rotorua at 10am. 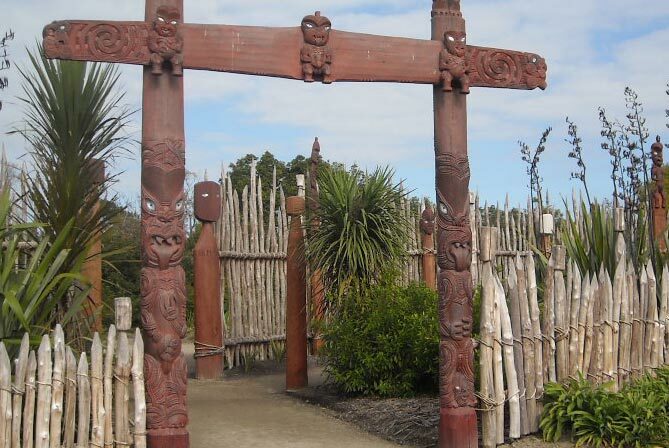 Arriving 10am at Te Puia Marae for a Maori Culture welcome and show. This is a ceremony of encounter between two parties who meet for the first time. Host warriors challenge the visiting party to find out their intentions. If these are friendly, the visitors are invited into the ancestral meeting house. The gentle pressing of noses symbolising the joining of two life forces creating an atmosphere of friendship and unity. This performance celebrates the very best of Māori performing arts. It includes weaponry displays, action songs, the famed haka (challenge) and the graceful poi. This was a favourite pastime of old and young alike. Performers pass batons to and fro in time to the rhythm of the song, testing their skills of agility and hand-eye co-ordination. Before battle the warrior would summon all his strength to perform this challenge. Aggressive actions, such as bulging out the eyes, thrusting out the tongue and making guttural sounds, would serve to intimidate any enemy. Hand and body actions accompany songs, portraying traditional stories and legends in dance. Then onto a guided tour through the Geothermal Valley and then onto the Stone and Bone Carving School. We then have a wonderful Hangi lunch. ‘Steam Box’ is a special new daytime experience at Te Puia. ‘Steam Box’ sees manuhiri (visitors) use our ancestors’ centuries’ old Nga Wha cooking method. Manuhiri select vegetables, chicken and seasonings for their lunch before the individual packs are placed in to the Nga Wha (thermal spring or vent) to cook. Guests then head on an exclusive guided tour of the National Schools of Whakairo (Wood Carving), Pounamu (stone) and Raranga (weaving). A weaving workshop, where Manuhiri weave a flax memento to take home, follows, before the tour continues down into Te Whakarewarewa Thermal Valley. The valley is chance to see Kiwi birds, hot springs, mud pools, silica terraces and geysers. It culminates with Manuhiri viewing their ‘Kai’ (food) lifted from the Nga Wha (steam box) and ends with a picnic lunch beside the world famous Pohutu Geyser. 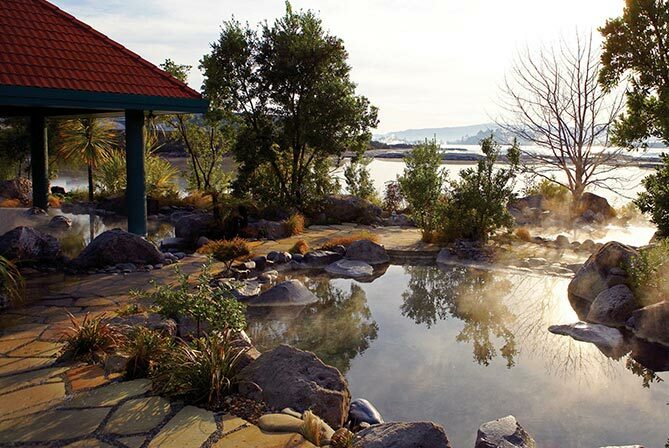 After all this culture, we then move on to the Polynesian Spa where you can relax and book in for a massage or just have a relaxing spa in the hot mineral pools, if this is not your cup of tea, we can take you into town for a spot of shopping. The bus will then leave from Rotorua at 4pm, arriving back in Auckland for 7pm. Since before the beginning of the 20th century the wonders of the Whakarewarewa Geothermal Valley have been brought to life and shared by the activities of a remarkable group of women. These are the official guides who collectively, have conducted millions of visitors through the valley and village. Perhaps of greater importance was the fact that this amazing area was their home, their own backyards. In most cases they had been born in the Whakarewarewa Village and had grown up playing amongst the boiling pools and listening to the stories of their elders. The legacy of these guides carries on, with many of today’s guides at Te Puia descending directly from these world renowned women.